For the last couple of weeks, Gus has had one thing on his mind -- putting his toys in something else. In and out, out and in. Doesn't matter what it is, he wants to put it in something else. Then he wants to retrieve it, and try again. And when I think about it, I get the appeal! Things disappear and then come back! Somethings will fit into another container, somethings will not. Its the motion of his hands, it's the sound of the item dropping. It's all exciting! Once I started to notice this interest, I made sure to put out some toys/work to meet this need. I say toys/work because there is really no distinction at this age. His toys are his work. His work are his toys. In Maria Montessori's words, "play is the work of the child." 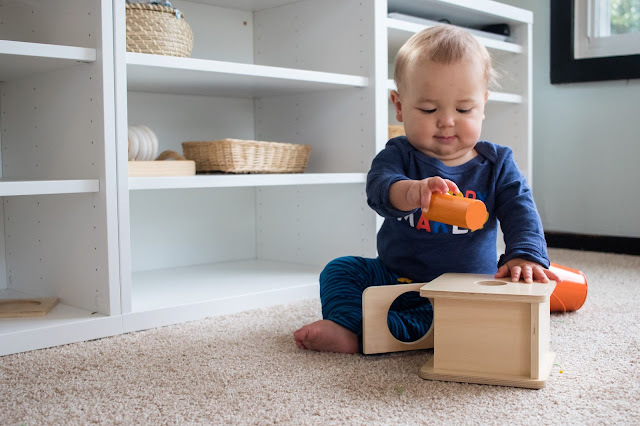 To him, everything he explores in his environment is his toy, and every toy is his work. It's a beautiful entangled dance, one cannot be separated from the other. If you observe your baby and see an interest -- respond. And, it doesn't have to be complicated, or expensive. Just some simple materials to meet that need. No reason to force an interest or guess at what your child wants or needs. Sit back, watch, and respond. 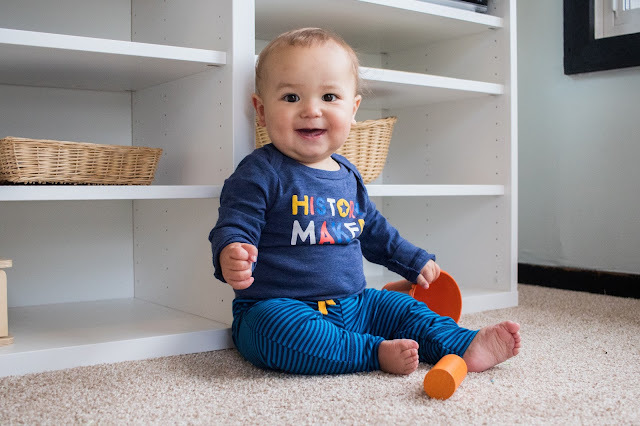 Practically, for us, that has meant adding a few materials to Gus' shelves. 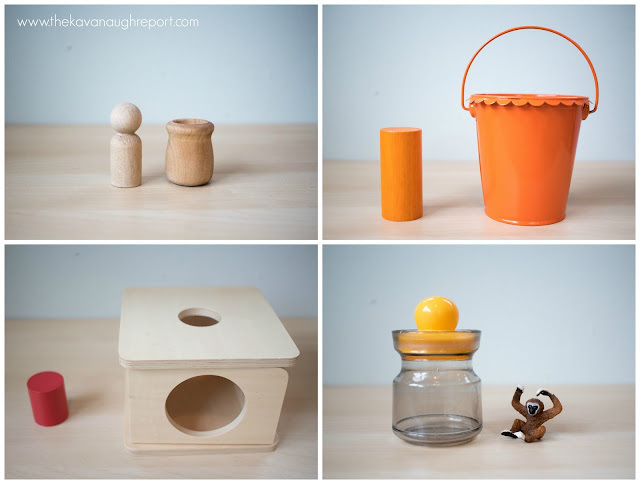 These included a Montessori peg and cup, a simple bucket with a puzzle piece, an imbucare box, and a thrifted jar with small monkey. Each serve the purpose of putting something in another thing. They each do so in a little bit different way and Gus is free to explore. 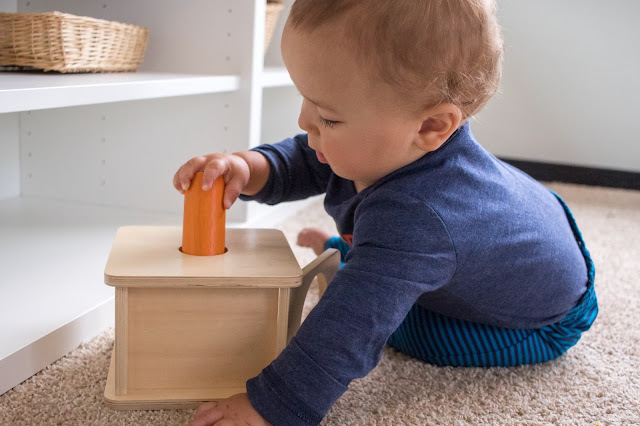 You'll notice in the pictures, it was actually his discovery that the orange cylinder fit into the imbucare box too. 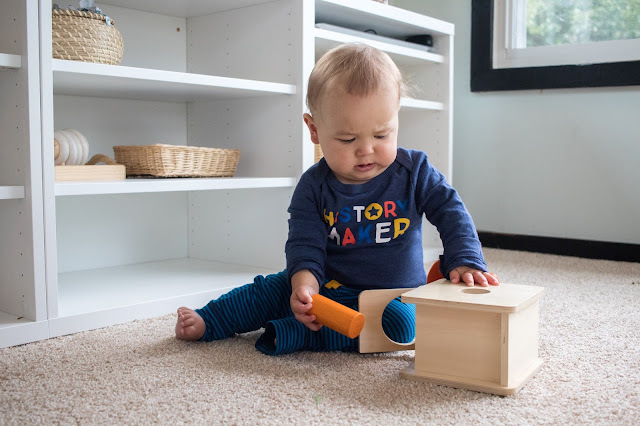 There's no pressure for him to use the material correctly, just the opportunity to explore. In placing these materials on the shelves, I did model them for him, but then he is free to explore. Have you noticed a strong interest in your baby? How have you responded? This is exactly what my little guy loves doing right now! I find it fascinating to watch how long he'll spend taking things in and out of containers. Isn't it!? I'm constantly amazed by how fascinating Gus finds it! I love your blog! So helpful as I try to find things to work on with my daughter, who is close to Gus's age. Do you have any recommendations for other blogs or books to read to get up to speed on work that is age appropriate? Thanks for all of the great info! My nine-and-a-half month old has been grabbing my pencil and sticking it in the holes in my notebook. Today I took a Little Munchers snack tin, cut a hole in the lid, and cut some straws in half so he could stick them in the hole and drop them all the way into the tin. He really likes it! I love that by paying attention to what he’s already doing, I can set up little games for him that have just the right level of challenge to keep him engaged :) And now I have something to give him when I’m trying to write in my notebook!